If you're looking for a beautiful all-in-one aquarium then the biOrb CLASSIC 15 Set black Grass Field is for you. You can be up and running in no time, everything you need is in one box. It really is a case of just adding water and fish. 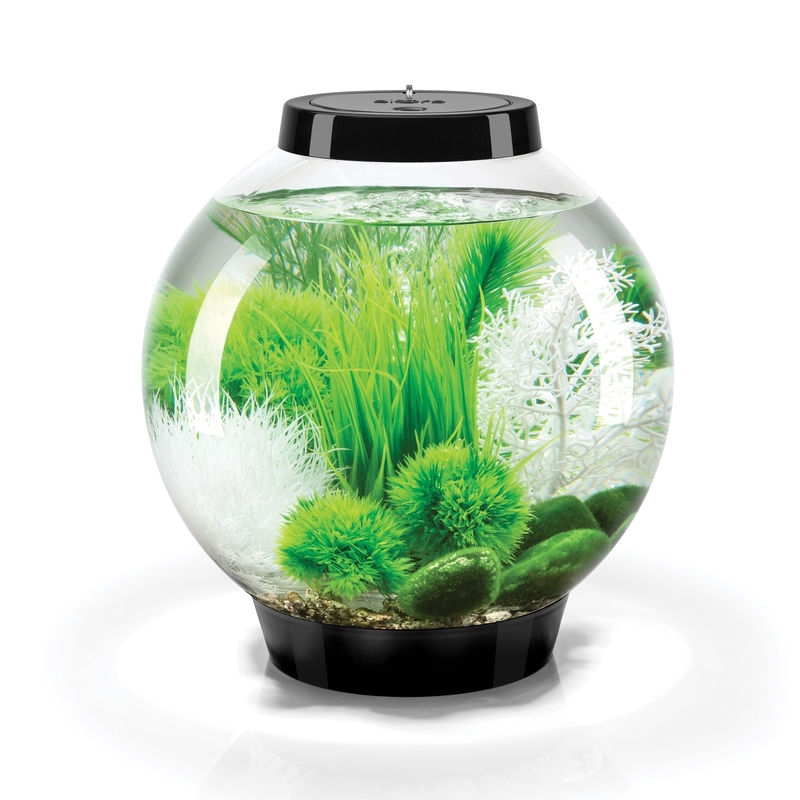 The biOrb CLASSIC 15 Set has a biological filtration system that is bigger than any other similar sized aquarium. In fact, many aquariums twice its size have less biological filtration. To maintain your biOrb CLASSIC 15 all you need to do is simply replace the filter cartridge every six weeks and change a third of the water every two weeks. 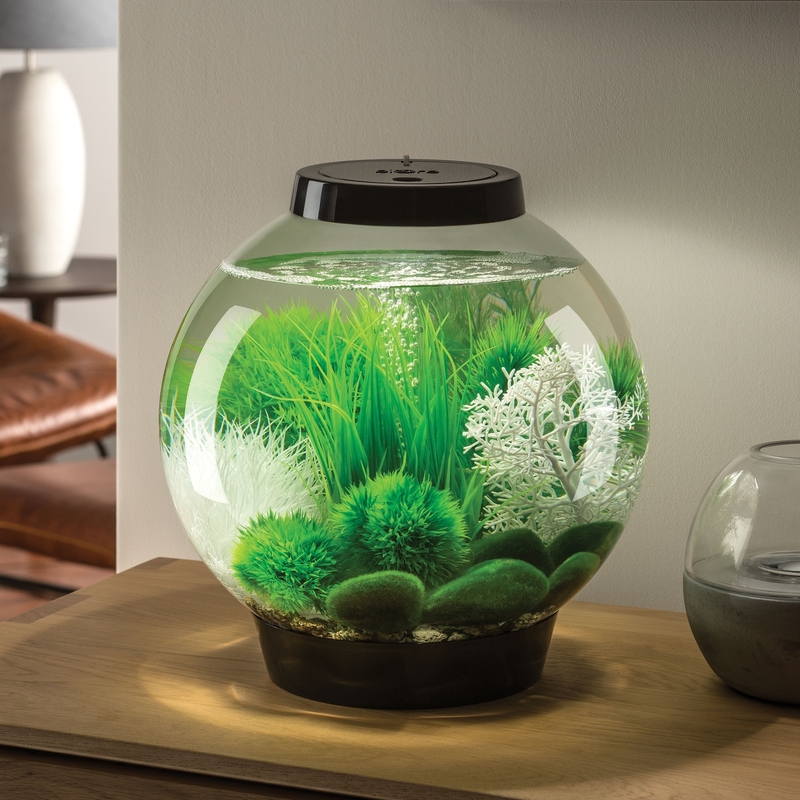 The biOrb CLASSIC 15 is an illuminated aquarium equipped with a Standard LED Light. Furthermore, it includes a small Grass Ring, Moss Pebbles, green Topiary Ball Set of 3, small green Feather Fern Plant Set, white Sea Lily, and small white Sea Fan. For your peace of mind, the light and air pump are low voltage. The aquarium is backed by a 2 year guarantee. The aquarium itself is made from acrylic which is ten times stronger than glass. All in all, a perfect starter aquarium with all the performance you'd expect from a bigger set up. All biOrbs have a filter at the bottom of the aquarium. It's where waste naturally settles. Simply put, the filter works where there is most to filter. The biOrb's air driven filtration system creates vigorous flow and a constantly changing water surface. This maintains oxygen saturation. The circular flow of water then collects any fish waste on the way down. 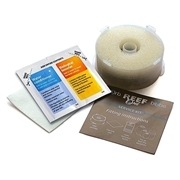 Waste is drawn through cermic media where natural biological filtration absorbs toxins. 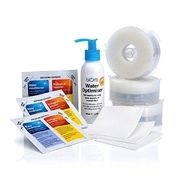 The freshly oxygenated water also feeds the beneficial bacteria. Any remaining waste is trapped by the sponge cartridge. The water then passes through resin particles and natural stabilizers to remove additional toxic substances and keep pH levels constant. The clean water is then oxygenated as it flows back up the bubble tube to repeat the cycle. Acrylis is incredibly strong. In fact, it's used in airplane windshields. It's also very clear. Acrylic has a transparency rate of 93% making it the clearest material known. biOrb Standard LED Light illuminates your biOrb with bright white LED's that are suitable for 50,000 hours of lighting. Long life LED's mean that there are no bulbs to change. The LED Light is also low voltage for safety.